Yes, you read that right! 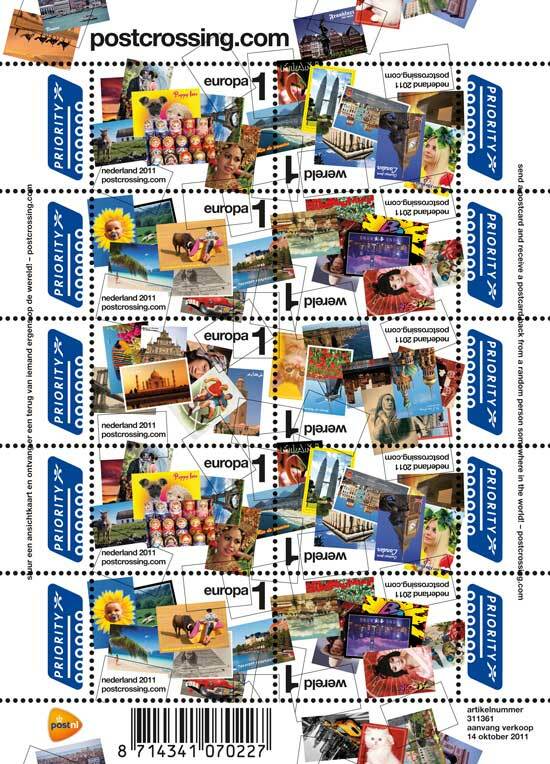 On October 14th, PostNL will launch a real stamp, featuring Postcrossing! How awesome is that? For us, it’s a huge honour that the project was deemed worthy of being featured in a stamp, and we’re very grateful to PostNL (the Dutch postal service) for making this dream come true. We’d also like to thank postcrosser Raymond68 – the Postcrossing stamp exists because of his efforts and persistence. Neat, right? There are several different stamps, both for Europe and the rest of the world, featuring the traditional postcard motives. The first stamps will be delivered to Paulo on October 15th, during the Postex event in Apeldoorn. Postex is an annual event for philatelic collectors, featuring celebrating associations, youth philately, traders from home and abroad, foreign postal administration(s), Day of the Stamp, exhibitions and much more. If you’re in the area, come and say hi! There will be plenty of stamps for sale, and we’ll have a small presentation about Postcrossing around 10:30am. Really cool idea :) Now we can send our cards AND add a real dutch post crossing stamp to it. CONGRATULATIONS. Now I don't care much for stamps, but I would love to get a postcard with a postcrossing stamp. THIS IS AWESOME. Thanks to Raymond68. Well done!!! Cool! I'm going to buy them for all my postcrossing postcards. It's great because Postcrossing is so popular in the Netherlands, soon enough most postcrossers will receive a card with a stamp like this! :) 12% of my postcards so far came from there. I would also like to buy that sheet! Completely amazing !!! Unfortunately European stamps are not yet usable in other European countries, unless I surely exclusively use theses stamps ! Like everyone, I would so appreciate to get cards with such stamps. Hope much more posts over the world will launch similars ! Great job guys..I wish i could receive one too. I love these!! I'd love to use these and hope to get one from The Netherlands soon. Already ordered mine, hope to find them in the mail soon. Will try to use them on most cards. Hope other countries will follow. Just great!!! I can't wait here! i just Want to Receive those stamps! Any body...! please! sounds fabulous to have a postcrossing card with a postcrossing stamp! I pre ordered a lot of them, so after 15 oktober I have them on my Postcross cards !!!!! Awesome! I want that set of the stamps...so cool!!! How great !! Unbelievable ! Yeeeepeeee ! So proud to belong to that project ! That's amazing!! Congratulations, Postcrossing! I think you'll get many more users thanks to those stamps! This is really cool, it will make the cards we receive from The Netherlands even more special. I have also pre-ordered them, 10 sheets to start with! From 15 October onwards all my cards to be sent will have a Postcrossing stamp. So, Europe, World, watch your mailbox! I'm going to buy something like 20 sheets of these if I can get them, I think all postcrossers will be dying to get their hands on a postcard with one of these stamps. That's really neat. I hope I receive a card with one of the stamps on it. I'll treasure it. Fantastic idea!!!! I would love a sheet of stamps, or two, plus cards with them on so anyone who can buy these stamps and is sending me a card please, please put one on it. My husband is an avid stamp collector so will greet one with open arms. I promise he will treaure it as he does all his stamps, this one will be extra special though. I knew it...I am not srprised at all...Postcrossing deserves it. It will be a very ppulaar stamp, and I hope to receive one on a great postcard. Congrats to the Netherlands, and allthe crew on Postcrossing! Is this stamp in the shops from oktober 15? In this case I will use it on my next postcard!! So awesome! I want some!!! I`m looking forward to get one or more! They are beautiful! Finally a nice stamp to send on a card. Postcrossing earned the stamp and attention. I've ordered 4 sheets, hope to get them soon. Great news! I'll certainly buy some sheets and use it for Postcrossing. I already bought some, but I get them later. Awesome! I would love to buy some! How can I buy some? This is great news! :) I hope I get a card from Netherlands with this stamp on it..
Oh wow, I'm sooo going to buy these! This is really cool ! And the postcards featured are very nice and colourful, too. I hope I get a postcard with one of those stamps someday ! Congratulations for the great idea! I hope to add them to my collection.I'll like so much! That is so cool that Postcrossing is being recognized like that - what an honor! This is extremely exciting news. Well done Postcrossing to be recognised in this way. Like everyone I'd love to get a postcard or three with these stamps!!! Fingers and toes crossed . . . . . . . .
Sensational news. What a spine-tingling moment. I'm proud to be part of something being featured in a stamp. Any chance I could buy some from Australia? That's pretty cool, I'm thinking of receiving some of them from now on! What a wonderful compliment to Postcrossing. Can't wait to receive one (or two) way down here in NZ. very cool! Please Dutchies use these stamps on any postcards you send me! Wow, this sounds incredible! Way to go! It is so cool! I have ordered some sheets and can't wait to receive them so I can send them to you! You can pay in different ways, anybody can buy them. Go and shop! Like I did. I'm so excited, can hardly wait !! I ordered some sheets but haven't received yet ! Visited also some shops yesterday, but nothing :( Perhaps today, but sure tomorrow :D :D !!! Wow, great news! Congratulations! Postcrossing is a fantastic idea and the best award is this news. All post from worldwide could design a special year stamp to celebrate. I have ordered 20 sheets. Congratulations to Paulo and the team. This is a great advertisement for Postcrossing (as if it needed it!!) and is a little bit of recognition for all of the work that the Postcrossing team put into the site. I hope other Postal Services (hello Royal Mail!!) take notice and do something similar. Well done Raymond68 for organising this. So awesome! I hope I get a postcard with one of the stamps. Yay! Congrats, Postcrossing! This definitely brings more attention to this wonderful exchange program. I hope I get one of these stamps in the mail! Awesome! You can be sure this Dutchie will rush to the store the 15th and right away buy a whole stack of these, to send with all my officials, swaps and RR's. I am so gonna buy many sheets of these stamps. Thank you PostNL!! Can you also get the stamps in dutch postalstores (post stores, youknow :p). Because I'm dutch and those stamps are AMAZING! Wonderful. Hope I will get written postcards using all these Postcrossing stamps... one day. Wishes come through in postcrossing, LOL. Fantastic achievement!!! I hope i can get one one day! thanks Raymond68 and design team...Great Job!!! Wow..it really makes members excited especially for those who have joined since years ago! And I hope PC gets more and more well-known and attracts more and more interesting guys! That's great! Long live to Royal Dutch Post! I want one of this awesome stamps. Maybe my postcard sent is hidden among all this beauty. awesome！ i hope i'll get one card with these stamps on! This is great! I'm hoping like everyone else that we get one of these stamps on a card from the Netherlands...it would be nice to buy a sheet too. I already ordered them on line (10 sheets) and will be using them on all my postcrossing mail!!! Proud of our little Dutch post system, that has changed so much lately. Keep an eye on the mailbox, it is coming your way. Ordered 4 sheets some weeks ago and hope they will arrive today! Have spend my whole week looking for them in the shops, but no luck so far! I ordered 3 sets...so they will be on their way soon! They look awesome! That's great news. I ordered them yesterday. Hope to have them soon to put on my Postcrossing-cards! I just ordered some sheets too, so I will be using them on my cards in the near future as well! They are great! I'm really envious of the Dutch user, they can get so wonderful stamps matching their postcards. Really great! How COOL is that!!!! CONGRATULATIONS! The Germans on the forum already think about how we can ask Deutsche Post to do the same??? Ace! What a fab. idea. I hope to receive a stamp like that on a postcard when the stamps are available. Way to go! ....and Congratulations! Amazing!!!! I'd love to have those stamps!!! For people that want to buy those stamps, if you have a paypal account I would be happy to order them and send a sheet of them to you. I do not want to swap or exchange stamps, but just buy them for you and send you them. You can contact me by my profile. I also love collecting stamps a lot,and really want to collect a sheet of the postcrossing stamps~so is it possible to arrange a private swap for you?Maybe I can swap them with stamps & banknotes from North. Korea!!! Why are stamps from Netherlands always so ugly? I'll try to get some.....and maybe you are the one who's getting it through postcrossing. An article about these stamps in September made me curious, and it has started me postcrossing. Until now ... I am happy to have found postcrossing. I'll certainly go and buy a few sheets of these stamps! Wow congrats to Postcrossing! Well deserved recognition!!! Hope other countries get on board with this awesome idea! congrats for the postcrossing team! see the above link you can order them online. I've ordered a bunch of them from Collect Club. I had hoped to receive them yesterday, but alas.. Hope I'll get them on Monday so I can send some postcards with them. I hope to get those stampsheets quikly so I can send them all over the world. Geweldig! Die ga ik zoeken! Die ga ik zeker gebruiken, het is alleen zo jammer dat de meeste postkantoren zo'n beperkt bestand aan postzegels hebben. Supergaaf dat hij er is! Is there any way to get one sheet of these or at least one? Yes. Today I'm going to buy them..So people watch your mailbox..
Paulo was here during the Postex event?? That's just around the corner! If we only knew then we'd definitely went to say hi! You can read about the Stamp release on the forum, and there was also an item about Postcrossing on the Dutch TV about 1,5 hours ago. Bought them today and already put 3 of them on postcards. I ordered mine at Postnl. I first went to our small postoffice and asked for the stamps. The woman looked at me as if I ordered the Mona Lisa itself. She had never heard about those stamps and never about Postcrossing! Well, luckily there's internet and online-shopping. Soon, al my cards will have a postcrossing stamp on them! Today I sent a postcard to the US with my very first postcrossing stamp on it! The way the rate is printed (Europa and Wereld) has me confused... are these actual postage? Is the 1 for 1 Euro? @nells250, the 1's on the stamp mean 1 for Europe (equal to 79 eurocent) up to 20 grams and 1 for World (equal to 95 eurocent) up to 20 grams. I just bought the stamps at a Bruna together with some postcards. The lady behind the counter didn't understand what I was asking for. but after a few minutes and times ten asking she gave me those stamps.. Will send out some cards with the "most wanted stamps" tommorrow. If you still have stamps with 1 for NL and 1 for Europe you of 2010 or 2011 you may still use them without having to add more stamps to come to the 50ct, 85ct or 99ct. Belgium is more expensive than NL btw. There it's 61cts, 93cts and 110cts. The difference with NL is, these are prices for mail up to 50 grams whereas in NL it's up to 20 grams. For us postcrossers its cheaper sending from NL! Woohooo, I got a card with a Postcrossing stamp today!!! It's the wonderful stamp showing the Taj Mahal, I adore it! Thank you to my dear friend Jetske! Thanks for the reply. Is "1" a class of mail, then? I tried to find the stamps on the post office website, but it wasn't in English. Maybe I can find a dealer selling them. HOW CAN WE BUY THOSE STAMPS? I'M REALLY INTERESTED !!! My next card I'll sent with a postcrossing stamp on it! Will send them out this weekend. Who will be the lucky person to recieve the first one ? Can we buy them yet? I bought 5 sets this week and the first poestcards with the postcrossing stamp have been sent! Congratulations! I love postcrossing. It's like having numerous penpals, without any of the obligation. As a collector of postcards, loved having a Postcrossing postcard with stamp. I just bought them last week!! Very nice that we have a special stamp for it! I will Paste it on the cards!! i'm out of that area...how can i get it?? ?it really nice!!! The website is in Dutch, though. They are very nice, and you could be very proud! Got one from the Netherlands with the postcrossing stamp. I love it!! with a nice stamp on it. The next cards i send, will have a postcrossing stamp. I'm from the Netherlands and the stamps are really beautiful. I'm very happy and proud with the first postcrossing stamp, made in my country. Thank you to Almeriaantje who offes to help people to buy the stamp. I've bought 2 sheets of stamps, so I think I'm gonna make a few of you very happy with my cards! Just mailed a few cards with the postcrossing stamps. They look great!!! Today I received one of the postcrossing stamps and I love them.. This is my third one and I am happy about that..
That is great! go to buy them tomorrow! Indeed very cool that the postalservice of my country has issued real PostCrossing stamp. That same postalservice has also another very special thing calles personalized stamps and you can have your own stamps made with the pictures you want. The only small problem is that you can only get stamps for use within the Netherlands (1 Nederland) while you also have 1 Europe & 1 World as seen in the PostCrossing stamp. and 1 set of 10 stamps cost 9 Euro's. And you have to put 2 stamps on the postcard. As some Postcrossers have had cards with these type of stamps on their cards from me. I allready used them on my first cards. I did'nt realised me that it is a hot item but now i will use them allways on my cards. I like to receive these stamps in the postcard send to me. nice! I hope i can buy some here soon! Dreams do come true!! A big thank you to Peggy Bongers for sending me a sheet of Postcrossing stamps for my husband. I have since had them on letters and cards, each one is greeted with a big smile. Well done Postcrossing, you are worth your weight in gold!! I just order some of the postrossing stamps of PostNL. Great stamps. I'll buy them as soon as I can. So, the next adresses I receive, will get a card with a cool stamp, I promise. Have already used the stamps on my cards and when you are lucky you'll receive one card someday.. If you are not lucky I can send a sheet of Postcrossing stamps anyway...just as a gift from a HAPPY POSTCROSSER to another.. I'm happy to report that I have received a card today with a Postcrossing stamp! Yay! I'm from The netherlands, WHO wants a SPECIAL postcrossing.com STAMP?!?!?!?! Great idea! Just bought 30 postcrossingstamps, so watch your mailbox! Oh, I hope, like everyone else, to get a card with one of these stamps. Now, I'd like the United States Postal Service to make a Postcrossing stamp! Very godd, very nice, I love the stanps ! Awesome!! Congratulations Paulo and PostNL. Hope this extends to lots more countries..
My first Postcrossing stamp has reached England!! Yay! Wow,I received a card with the postcrossing stamp.It's really a special card!! I am proud to be dutch. I'll buy them. Wow I would love to get one card with that stamp! YEA!!!!! I received one! It looks very cool! I received a Postcrossing stamp on my card from Albert NL-899702. Yippee! Haha I have this one ! Hope I receive a postcard from Netherlands!! So: If you receive a card with this stamp and you're happy, let us, senders, know! I want to buy these. Is it possible to get the stamp now?I really want some! Today I wanted to buy a sheet Postcrossing stamps again. But they can't be sold anymore. Luckily I got a piece of it. wou vandaag weer een velletje postcrossing postzegels kopen. Maar ze mogen momenteel niet meer verkocht worden. Gelukkig kreeg ik nog een velletje mee.